Hurry over to Kohl's where cardholders can save 30% off your entire purchase with the promo code LOVE30 at checkout. Plus, cardholders can score FREE shipping on every order with the code SHIPFEB at checkout. If you're not a cardholder use the coupon code: BIGSAVINGS to save 15% or save 20% on your $100+ purchases. 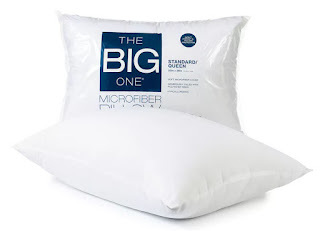 One of my favorite deals is these The Big One Microfiber Pillows on sale for just $3.39 with the code: BIGSAVINGS or if you're a cardholder just $2.80 shipped with the code: LOVE30 and SHIPFEB. Also if you have enough checkout code HOME10 $10 off your $50 home purchase. Through February 14th, you'll get $10 in Kohl's Cash for every $50 you spend. If you're not a cardholder don't forget that you can also choose free in store pick up!